Frau Angela Merkel ist unglaubwürdig, wenn Sie sagt dass Deutschland ein demokratisches Land ist, dass die Menschenrechte einhält. Frau Merkel nimmt es nicht so genau dass das Landesgericht in Köln nicht Artikel 10 in dem Menschenrechtsabkommen über Meinungsfreiheit respektiert. 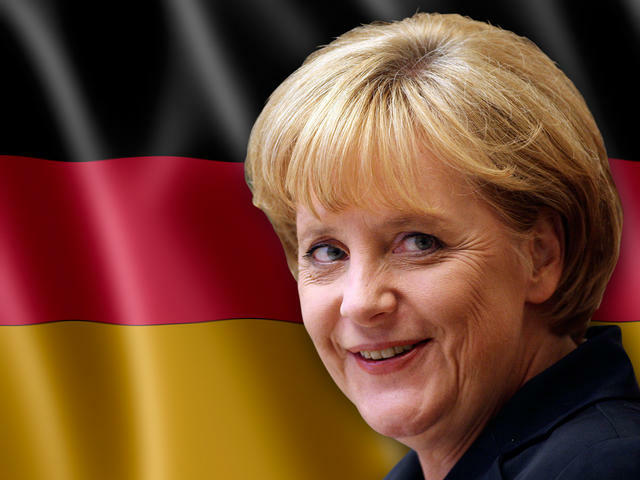 Das Frau Merkels Beamte sich berufen auf Anwälte die umsonst helfen können und die Anwälte die ich kontaktiert habe immer gefragt habt, haben sie Geld oder eine Versicherung sonst keine Hilfe. Diese deutet nicht auf Rechtssicherheit für normale Menschen in Deutschland. Und gleichzeitig benutzt die Polizei in Köln polizeitstaatliche Methoden. 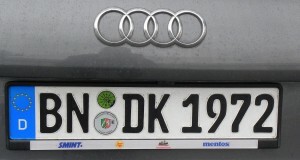 Dann kommt mann nicht weit. 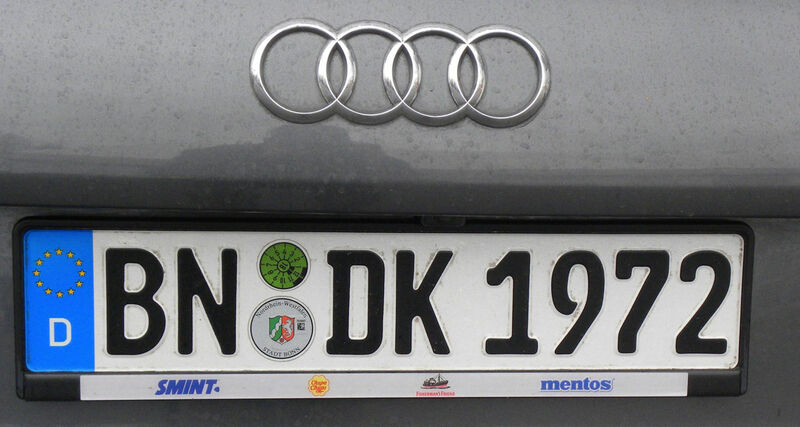 Two employees from Chupa Chups/Perfetti van Melle came in this car from the company office in Bonn. They threatened to call the police and a lot of lawyers to get me away from the streets in front of the ISM candy fair 2016. We never saw any police or lawyers – do Chupa Chups/Perfetti have problems with the law? I wonder when they realise that they can not silence me, nor ignore my rights to free speech. I want to thank everyone who greeted me and photographed me in front of ISM 2016. You mean a lot and I am happy for all your encouraging words. Here is also a photo of the most photographed man at ISM 2016. Again! Helt til grin ved ISM messen i Køln 2016! De to ansatte fra Chupa Chups/Perfetti van Melle, der kom kørende i denne bil fra Bonn, kom med så mange trusler om at politi og advokat ville komme og smide os væk, men vi så dem aldrig. Hvornår mon de kommer? Eller har Chupa Chups/Perfetti et problem? Hvornår fatter Chupa Chups/Perfetti van Melle at selv de ikke kan knægte ytringsfriheden? Men jeg vil da gerne her sige tak for de rigtig mange og venlige tilkendegivelser, der blev vist os i dagene under udstillingen. Her også lige et billede af den mest fotograferede person uden for udstillingen. A big “thank you” for 4 great days at the ISM Fair 2015 in Cologne. 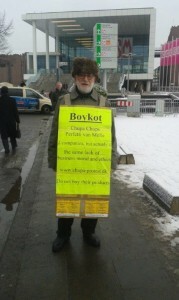 Again, it was a big pleasure to perform the protest demonstration in Cologne against Chupa Chups & Perfetti van Melle. I was approached by an angry representative from Perfetti van Melle, who threatened to go a and get the police. But I never saw him again, nor the police. It appears that Chupa Chups and the police have realised that they are not able to stop my freedom of speech. Let’s hope Chupa Chups realise, that there is only ONE way to stop my protest demonstrations – pay the bill! Thanks for the many many positive reactions and the many photos that were taken. I hope these photos will be posted everywhere. Endnu en tur til Køln er overstået og jeg havde 4 pragtfulde dage ved ISM messen. Igen i år 2014 har det været en stor fornøjelse at være til demonstration i Køln mod Chupa Chups & Perfetti van Melle. Mange tak for de enorme mange positive tilkendegivelser og de mange billeder der blev taget. Håber at de kommer ud rigtig mange steder. Denne gang uden at blive chikaneret af hverken politi eller retsvæsen. Chups Chups har tilsyneladende indset at man ikke kan stoppe ytringsfriheden. Så nu mangler vi bare at Chupa Chups betaler hvad de skylder. 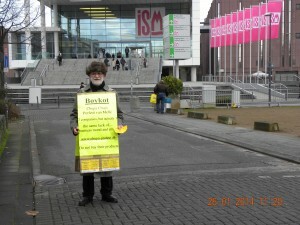 Yet another trip to Cologne, where I had 4 fabulous days at the ISM fair. 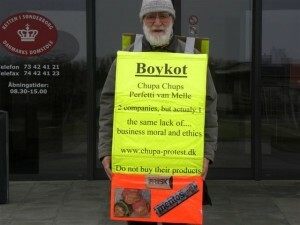 Again, it was a big pleasure to perform the protest demonstration in Cologne against Chupa Chups & Perfetti van Melle. This time I was not harrassed by the police nor the court. It appears that Chupa Chups have realised that they are not able to stop my freedom of speech. Now we only need Chupa Chups to pay their bill. Chupa Chups & Perfetti van Melle were the laughing stock in Cologne. Chupa Chups have still – after more than 10 years – refused to pay their debt to a small Danish supplyer. For the same reason, I will keep showing my protest against their lack of ethics. 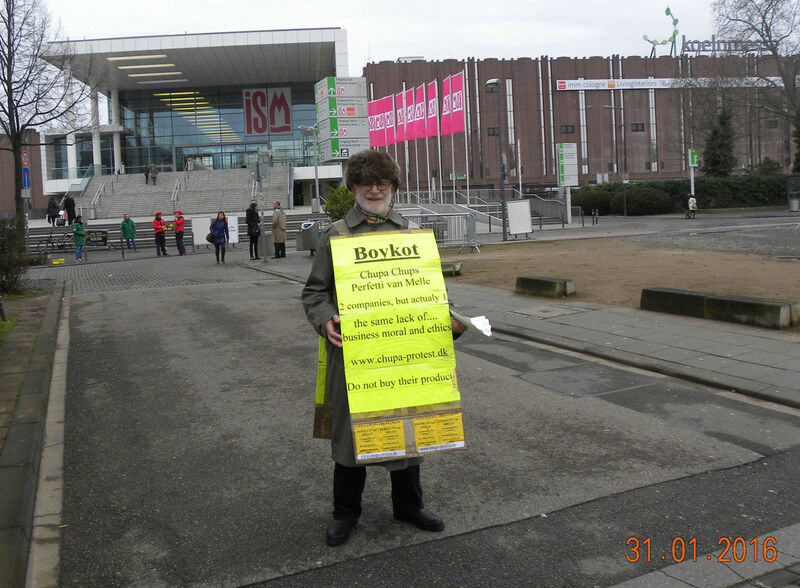 During my latest demonstration in front of the ISM candy fair in Cologne 2013, the German lawyer of Perfetti, Dirk Strohe, tried to get the police to ban my demonstration on public streets. Sunday morning at 9,30 am. 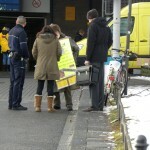 First there were 2 police officers together with Dirk Strohe and then another 2 police offiercers joined. The 4 police officers were all very upset and threatened me with arrest and penalties. But I kept holding on to my rights to demonstrate on public streets and they had to withdraw without any success to silence me. I truly perceived the behaviour from the police officers and lawyer Dirk Strohe as abuse and, to a certain extend, as psycological terror trying to bully me to silence. Monday morning, lawyer Dirk Strohe tried again, this time with the assistance from the Cologne court (Landdesgericht Køln), who also threatened with arrest, penalty and jail. Again, all of them had to retreat with no luck. All in all, these were pretty bad days for Chupa Chups & Perfetti van Melle and their lawyer Dirk Strohe. Hail the freedom of speech. Discussin with the person from the court of Cologne. Chupa Chups & Perfetti van Melle var helt til grin i Køln. Selv efter mere end 10, har Chupa Chups stadig ikke betalt sin regning til en lille dansk virksomhed. Derfor fortsætter min protestdemonstration naturligvis. Under min demonstration foran ISM slikmesse i Køln 2013, forsøgte Perfetti´s tyske advokat Dirk Strohe fra Køln at få politiet til at forbyde min demonstration. Søndag morgen kl. 9,30. Først var der 2 betjente sammen med Strohe og så var der 4 betjente. De var alle meget ophidsede og truede med både anholdelse bøde samt fængselstraf. Men jeg stod fast på min ret til ytringsfrihed, så de måtte køre med uforrettet sag. Dette kan jeg kun opfatte som psykisk terror fra advokat Strohe og politiets side. Mandag morgen forsøgte Strohe igen, denne gang med hjælp fra Landdesgericht Køln der også truede med anholdelse, bøde og fængsel. Også denne gang måtte de gå med uforrettet sag. Alt i alt er par dårlige dage for Chupa Chups & Perfetti van Melle og deres advokat Dirk Strohe. My new video, see it right here! Ny video online, se den her! The verdict has been announced! Long live freedom of speech! As expected, Chupa Chups / Perfetti van Melle along with their Danish lawyer, Peter Trusø have AGAIN lost a lawsuit set against me. It is their 6th defeat in an endless fight to keep my mouth shut about their inappropriate business ethics. I was AGAIN completly acquitted of all charges and Chupa Chups shall pay 25,000 DKK in court fees. I wonder when (or if) they will ever realise that we have freedom of speech in Europe or at least in Denmark. Why is it, that big companies believe they can silence the free oppinion just because they have a lot of money to take people, like me, to court? Use your money to pay your bills – end of story. If Chupa Chups keep persisting, that there was no agreement between Spacerocket and Chupa Chups, why don’t they trial this issue in a Danish court room? Surely they don’t have the courage. My fight for justice will continue – we will meet again on the streets in Cologne on the ISM in January. If you or your company have had a similar bad experience with Chupa Chups / Perfetti van Melle, then write to me and and tell me about it. If the story is relevant I may publish it on this web page - with your permission.